(Allan Stone Gallery, New York); sold 1963 to Harry N. Abrams, New York; gift 1991 to NGA. Art for the Nation: Gifts in Honor of the 50th Anniversary of the National Gallery of Art, National Gallery of Art, Washington, D.C., 1991, 420-421, color repro. 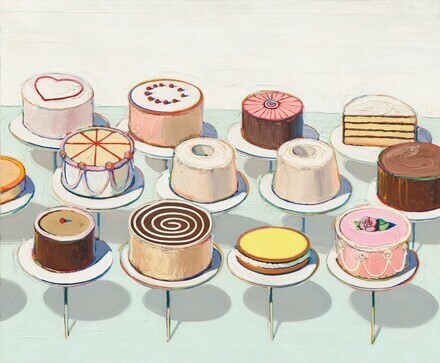 Wayne Thiebaud: A Paintings Retrospective, California Palace of the Legion of Honor, San Francisco; Modern Art Museum of Fort Worth; The Phillips Collection, Washington, D.C.; Whitney Museum of American Art, New York, 2000-2001, no. 26, repro. Gingold, Diane J., and Elizabeth A.C. Weil. The Corporate Patron. New York, 1991: 109, color repro. Kimmelman, Michael. "What's the Best Work of Art About Food?" New York Times Magazine (October 2, 2011): 51, color repro.